Desert Green Creations is a full service custom landscape contractor and installation company. We can provide you with design service so you can see your project come to life. We offer free quotes to all our customers. When your project is completed, we can offer you follow up service to keep your landscaping looking beautiful year round. If you have a problem after we have finished your project, we will come back and correct and or repair the problem immediately; when you call we will answer. Let us help inspire you. Its what we do. Get creative! When something clicks, there is the “Aha!” moment. That is what we live for, bringing it to life. We can provide you with a design plan that will fit your needs and desires. The pricing is detailed so your project can be worked on in phases to maximize the beauty at all times. You will be completely satisfied with strict attention to detail that is guaranteed throughout the job. Our staff is well-trained and experienced in installation of all phases of the landscaping process. Our closer to nature landscaping ideas are built to last longer. We are determined to deliver designs that are durable. We will take your thoughts and ideas and make them real. Take a look at some of our previous designs. We promise out of the box solutions to fulfill your aesthetic needs. Our enthusiastic team is keen to get you top-notch landscaping ideas while meeting the highest creative standards of designing. We make sure that our clients receive the best budget friendly options to choose from. We undertake every kind of landscaping works based on our customer’s needs. We are committed to listen to your dreams and turn them into a beautiful reality. We keep ourselves up to the minute with the latest trends happening in the landscaping world. We have been nurturing landscapes for more than 30 years now. Our expert team has mastered the art of growing, watering and fertilizing the plants to ensure optimum growth and maintenance. Our solutions to landscaping are innovative enough to satisfy your vast expectations. We always make efforts to give customized ideas to match with the client’s requirements. 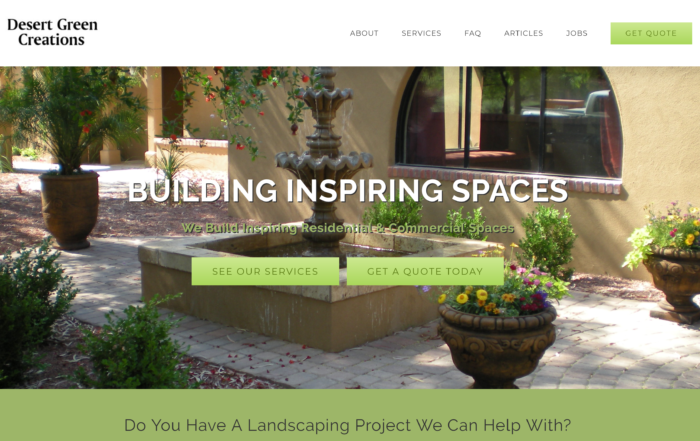 Desert Green Creations is pleased to announce our new website. We can now do everything from give you a quote to list our open positions. Check us out!